Forget the many stage adaptations of Alice In Wonderland. 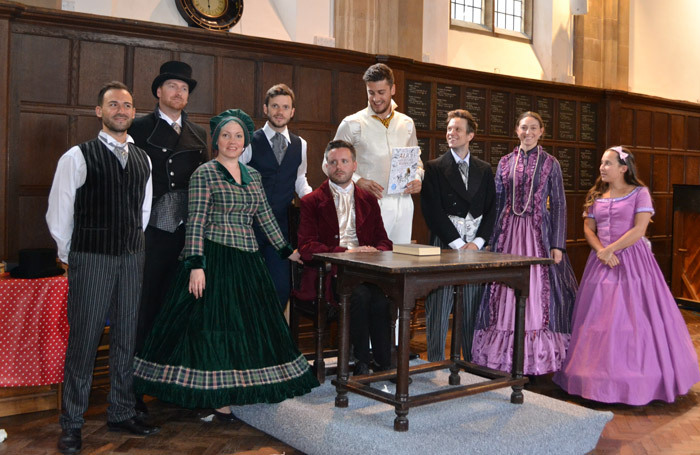 This new musical from Oxford Music Theatre focuses less on the fiction and more on the facts of Charles Lutwidge Dodgson, otherwise known as Lewis Carroll. CLD is an assured and accomplished creation, with an ensemble that works together tightly. Composer Michael Brand and lyricist Jane Bramwell split their main character into two, with Charles Dodgson and his ‘muse’ Lewis Carroll played by two different performers. We follow Dodgson at Christ Church College under new dean Henry Liddell. The Liddell children – including Alice – are mentioned but not seen. Although claiming to be factual there are still major conjectural leaps in the hagiographic tale: Bramwell and Brand suggest that Dodgson had an affair with Lorina Liddell and got her pregnant. Still, it’s a fun story. Brand’s music has a contemporary hymnal quality, the jaunty piano melodies of modern church music. It’s mostly set to existing lines by Carroll – snatches of Jabberwocky and the Alice stories. The quality is variable, as is the tone, from sweet – like the lullaby Sleep Softly Now – to the suitably nonsensical Twinkle Twinkle Little Bat. The enthusiastic ensemble provides solid support for Stewart Briggs as Dodgson and Emily Louise Tomlins as Lorina Liddell. Briggs’s timidity and nervousness is well judged, although he’s too quiet when he sings. He’s a good contrast to the rakish and confident Peter Watts as Lewis Carroll, swaggering around the stage in cricket whites. Watching the story only a few metres from Christ Church College, where these lives played out a century and a half ago, adds an extra poignancy to this enjoyable production.